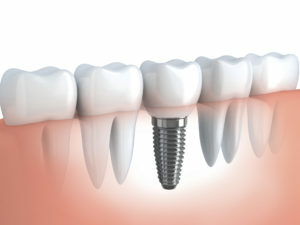 A dental implant is a small screw that is usually made of titanium alloy. It is embedded in the jawbone and connected to dental prostheses, which replace missing teeth. Dental implants are also known as artificial roots and fixtures. Dental implants are sometimes used to support loose, removable dentures or in combination with orthodontic treatment. Dental implants are mainly used to replace a single missing tooth, which, in most cases, is a premolar or a molar tooth. Tooth decay failed root canal treatment and cracking are some of the reasons that a tooth may be extracted. Front teeth, or incisors, are lost less frequently than molars. However, a missing incisor reduces a patient’s ability to chew and is also an esthetic problem. A single missing incisor can be replaced with a dental crown that is built on top of an implant. Besides replacing a single tooth, dental prostheses can be used to replace multiple missing teeth, including all upper or lower teeth. An implant-supported bridge is often used when three or more neighboring teeth are missing. When all upper or lower teeth need replacing, 6-8 implants are placed into the jawbone. A framework for the prosthesis is built on top of the implants from a material such as titanium. Replacement teeth made from ceramic or other materials are then built on top of the framework. Finally, the bridge is connected to the implants with screws. Dental implants are also used to improve the stability of removable dental prostheses, also known as dentures. A removable, complete denture can have poor stability, particularly if it is placed in the lower jaw. The jawbone often erodes following tooth extractions, and as a result, dentures may not have enough area to attach to. Removable dentures can be supported, for example, with mini implants. Mini implants are thinner than traditional implants and cannot withstand intense forces. They can be used to improve denture stability when the patient has removable complete dentures in both the upper and lower jaws. 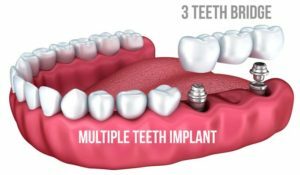 Four mini implants can be placed in the anterior portion of the patient’s lower jaw to offer support for the lower jaw denture. Small holes are then made in the denture in order to attach it to the implants. This procedure usually improves denture stability. Removable dentures can also be supported with attachments or bars that are built on top of the implants. Clips are fitted to the denture, and it is then snapped into the attachment or bar. In addition to dental prostheses, dental implants can be used in orthodontic treatments. The purpose of orthodontic treatments is to direct jaw growth (in children and adolescents) and to correct improperly positioned teeth (in adults) while considering occlusal and aesthetic factors. Different appliances, both fixed (bonded directly to the teeth) and removable, are used to help move teeth. The appliances place a gentle force on the teeth and slowly move them. Sometimes, the neighboring teeth, which assist in moving the crooked teeth, shift to an unwanted position. A small titanium implant, designed for orthodontic anchoring, can be placed in the palate or next to the tooth to serve as an anchor. Forces can be placed on the implant instead of on the neighboring teeth. Implants are becoming increasingly popular in orthodontic treatments, particularly in adults, when the patient’s own teeth don’t offer enough support and cannot be moved safely. One of the advantages of dental implants is their convenience. If placed successfully, dental implants look and feel like your own teeth. For most patients, it is the best and most convenient way to replace missing teeth. There are alternative ways to replace single or multiple missing teeth, such as dental bridges or removable dentures. Sometimes, a missing tooth is not replaced at all. Since there are alternatives to dental implants, it is important to know their benefits and risks. A risk/benefit ratio has to be carefully evaluated whenever implants are considered. Since dental implants are made of different materials and are used for a variety of purposes, their costs vary accordingly. A replacement tooth, which is placed on the implant, is made in a dental laboratory by a dental technician. It has two parts, an abutment, and a crown. The abutment is usually made of zirconia or titanium or gold alloy. It is a connector, attached to the implant with a screw in order to connect the implant to the crown. The abutment has an important role in determining how the gum shapes around the replacement tooth. It also affects the shape of the crown that is later attached to it and determines how easily the teeth can be cleaned. There are both standard and individually designed abutments. Individual abutments provide beautiful and durable results and are therefore usually preferred over standard abutments. Dental crowns are made of ceramic, zirconium or gold. A dental milling machine fabricates crowns quickly. These crowns can be used to replace, for example, molar teeth. Incisors, however, are usually replaced with handmade crowns because their aesthetic requirements are higher. The cost of a handmade crown depends on the amount of work it requires. The price of milled crowns depends on the aesthetic requirements and the amount of work. Dentist fees depend on the length and difficulty of the procedures. Replacing a single tooth requires a pretreatment visit, 3-4 treatment visits, and possible follow-up visits. If the procedure is aesthetically challenging or requires bone grafting, the number of visits may double or even triple. The dentists’ price includes a treatment plan, implant placement, surgical equipment and crown fabrication. If additional procedures, such as bone grafts or temporary prostheses, are required, the price can go up by several thousands of dollars. Fees may also vary from dentist to dentist. Dental specialists who focus on dental implant treatments may charge 10-30% more than general dentists. Dental implant treatments are performed by dentists who have specialized in implant and prosthesis treatments. The basic study of dentistry currently includes basic dental implant treatment studies. However, performing successful implant procedures requires further study and training. The purpose of implant treatment is to add artificial teeth that support proper occlusion. Modern-day implant treatment starts with a treatment plan. Dental specialists who have specialized in prosthetic dentistry are best suited to planning and performing implant treatments. General dentists with training in the prosthetic treatment and other dental specialists can also perform implant treatments. Oral surgeons, periodontists, general dentists or other dental specialists usually insert the implant into the jawbone. Planning is an important part of the treatment. It is intended to review the condition of the teeth and bite, define the treatment objectives and plan how these objectives will be met. First, the patient’s mouth is examined in order to review the performance of the jaw joint and masticatory muscle and to check the bite, oral mucosa, teeth, and gums. Oral diseases such as caries, gingivitis, and tooth or tooth root infections are treated, and damaged teeth are removed before implant treatment is started. Dentists may also pay attention to the patient’s oral hygiene, including brushing and flossing and give additional instructions. A beautiful and functional dental prosthesis, which looks and feels natural, is the starting point for treatment planning. Implants have to be placed in the right spot and in the correct position in order for the treatment to be successful. During the initial examination, the dentist takes X-rays and makes plaster models of the patient’s teeth. X-rays are needed to examine the structure of the jawbone and to determine how much bone is available to support an implant. Plaster models are used both to examine teeth positions and occlusions and to plan optimal implant shapes and positions. In addition to plaster models and X-rays, computer programs can be used to plan the treatment. Cone beam computer tomography provides a 3D model of the patient’s jaws, which allows for different implant lengths and sites to be tested. First, a local anesthetic is injected in the site where the implant will be placed. Incisions are then made into the mucosa to expose the bone. A small hole is drilled in the jawbone. The depth of the hole ranging from 5 to 15 mm (0.2 to 0.6 in) depends on the length of the implant. The implant is screwed into the hole, and the incision is stitched closed. Depending on the procedure, the implant is left to fuse with the bone for between 2 and 9 months. A temporary denture can be placed to replace a missing tooth. Once the implant has become fused with the bone, the actual prosthesis can be made. First, models of the implants are created, and a dental technician uses them to prepare the prosthesis. Depending on the prosthesis, different work phases can be tested to ensure that the shape of the prosthesis is correct and that it sits accurately on the implant.What problems are related to dental implants? Dental implant prognosis is usually very good. Around 85-95% of implants still work faultlessly 10 years after they are placed. The most common problems are cracks in the replacement tooth and infection in the surrounding gum or bone. When the implant is placed in the jawbone, it becomes fused with the bone. Sometimes, problems may occur during the ossification process, causing the implant to not fuse to the bone in the desired way. Possible ossification problems occur in the first few months after the treatment. Therefore, the dentist who performed the implant procedure ensures that the implant becomes fused with the bone during the first months following the treatment. Osteoporosis, diabetes, and smoking can cause ossification problems. Certain medicines, such as cytostatic drugs and cortisone, can also increase the risk of ossification problems. Peri-mucositis is a gum disease in which the microbes in the mouth cause the gum around the implant to become infected. This is equivalent to a gum infection around natural teeth. Peri-implantitis is a condition in which the gum infection around the implant spreads to the bone. The bone that supports the implant thus deteriorates, and if the condition is left untreated, it can lead to implant loss. Peri-implantitis is equivalent to periodontitis in natural teeth. Patients suffering from diabetes and heavy smokers are at higher risk for connective tissue diseases. Poor oral hygiene may also lead to peri-mucositis and peri-implantitis. Like natural teeth, dental prostheses sometimes crack and break. Cracks are quite common in replacement teeth. Small cracks can be repaired with a filling or grinding. More extensive damage may require removing the prosthesis and repairing it in a dental laboratory. Although rare, dental implants sometimes break or fracture. If the implant is not designed or fabricated correctly or too much force is placed on it, it may break. If the implant is severely damaged and cannot be repaired, it has to be extracted. Which dental implant materials are used, and what is osseointegration? Since dental implants are placed in the bone, their materials have to be biomaterials. A biomaterial is a natural or synthetic material that can be used in close contact with tissue and body fluids without harmful side effects. A dental implant material has to be nontoxic and tissue-friendly. The implant surface has to be able to attach firmly to the jawbone. Implants also have to withstand mechanical forces, such as compression, pulling, twisting, corrosion and wearing. The most frequently used implant materials are metals and metal alloys. Test implants are usually made of ceramics, polymers, and plastic composites. Considering the requirements, titanium is a nearly perfect material for the fabrication of dental implants. It is a light metal that also withstands forces well. It is tissue-friendly, fuses to the bone and gum, and is easy to shape and polish. The most common metal alloy used in implants is made of titanium, aluminum, and vanadium. It contains 90% titanium, 6% aluminum and 4% vanadium. Aluminum reduces the implant’s weight and improves its durability, and vanadium reduces the implant’s thermal conductivity and increases its hardness. The titanium alloy (Ti6Al4V, grade 6) commonly used in implants is four times stronger than pure titanium. An alloy made of cobalt, chrome, and molybdenum offers a very tissue-friendly and durable material for implants. Pre-modern dental implants were thin plates placed between the gum and bone. They were made of alloys such as the cobalt-chrome-molybdenum alloy. Some dental implants are made of other metals, such as steel, gold, platinum and palladium alloy. However, titanium and its alloys have replaced most of these metals and are used as the predominant material for modern dental implants. Zirconia, or zirconium dioxide, is a very hard ceramic material. It has several advantageous qualities, and its use in dental implants has been developed. Like titanium, zirconia integrates well with the bone and gum. Zirconia also blends in well with the color of natural teeth and is almost corrosion-proof. Although zirconia implants are continually being developed, they are not yet widely used. The use of industrially manufactured polymers and plastic composites in medicine is constantly increasing. Their use in dental implants has also been developed and tested. Potentially successful materials for dental implants have been obtained by mixing plastic composites with, for example, carbon, aluminum oxide, glass ceramics, and hydroxyapatite. Polymers and plastic composites are challenging to sterilize, and handling them requires extra care. Because of these limitations (and the excellent performance of titanium implants), the use of polymers and plastic composites is still in the experimental stage. The diameter of titanium implants is usually between 3 and 5 mm, and their length is between 6 and 15 mm. A dental implant is placed in the jaw to support the prosthesis that is built on it. The prosthesis can be a single replacement tooth, or it can replace all upper or lower teeth. The implant has to properly integrate with the bone for the prosthesis to be stable. For dental implants to be stable, the jaw has to have enough bone to hold the implant. Implants that are longer and thicker require more surface area. For example, a 7-mm long, 3-mm thick (0.28 in long, 0.12 in thick) implant has a surface area of about 75 mm2 (3.00 in2). If, instead of using a 7-mm (0.28 in) implant, a 10-mm (0.40 in) implant with the same thickness is used, the surface area increases by about 40%. Similarly, if the diameter is increased from 3 mm to 4 mm (0.12 in to 0.16 in), the surface area increases by over 30%. The roots of lower incisors have the smallest surface area of natural teeth (around 150 mm2 or 5.91 in2); molars with multiple roots have the largest surface area (around 430 mm2 or 16.93 in2). It is important to choose an implant with the correct shape and size. The quantity and height of the jawbone where the implant will be placed usually determines which sizes can be used. In addition, the design can affect the surface area and functionality of the implant. Both compressive vertical forces and diagonal twisting forces are transmitted through the dental prosthesis and applied to implants. Implants resist compressive forces better than they resist diagonal forces. Implants may include spirals to increase the surface area and improve the implant’s mechanical attachment to the bone. The spirals also split the forces applied to the implant, increasing its durability. Spiral implants can convert diagonal forces into compression, allowing the bone that surrounds the implant to better withstand stress. The advantage of a spiral implant over a smooth implant is the improved durability of the bone around it. In other words, the jawbone can better withstand forces applied to a spiral implant than those applied to a smooth implant. This is likely due to spiral implants’ larger surface areas and ability to split forces more advantageously. The surrounding bone has to bond tightly to the implant for the implant treatment to be successful. This process is known as osseointegration, derived from Greek words osteon (bone) and integrate (to make whole). Besides dental implants, osseointegration of biomaterials, such as titanium and zirconia, is widely utilized in medicine (e.g., in artificial joints). Osseointegration was originally discovered at the end of the 1960s as a result of dental implant testing. In osseointegration, the bone tissue mechanically attaches directly to the implant’s porous and rough surface, forming a fully sealed implant-bone seam. The implant surface can be modified in various ways to improve ossification. The aim of the modification process is to increase the surface area and to improve the implant’s attachment to the bone. One of the most common ways to increase implant surface area is to sandblast titanium surfaces with aluminum or titanium oxide. Another way is to spray heated, molten titanium onto the implant surface (titanium plasma spray). Modifying the implant surface can increase its area by 6 or 7 times. Besides titanium and aluminum, hydroxyapatite can be used as a coating for dental implants. Hydroxyapatite is a component of both jaw and tooth bone, and like titanium, it bonds tightly to the jawbone. Hydroxyapatite treatment not only increases an implant’s surface area but also improves bone healing and prevents metal corrosion. The hydroxyapatite layer may detach relatively easily from the implant surface and serve as a breeding ground for bacteria. Coating treatment also increases implant costs; therefore, it is still relatively rarely used. Besides sandblasting and plasma spray, implant surfaces can be roughened with hydrochloric, sulfuric or nitric acid. Acid treatment can increase surface area by 30-80%.